From 2005 or perhaps earlier... 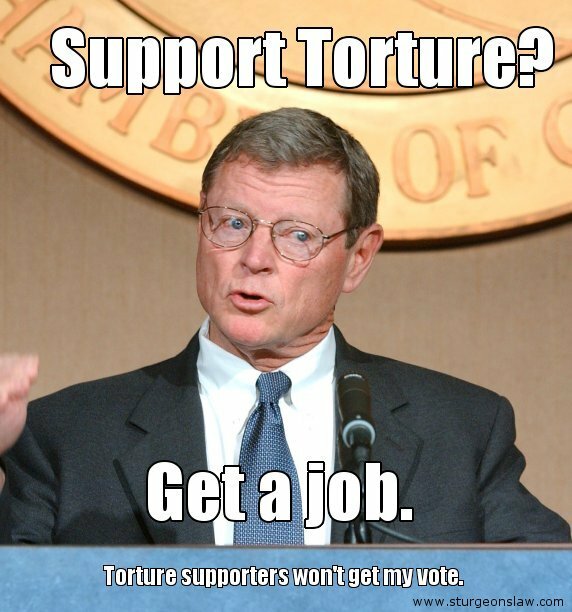 I am a political independent, tending to vote down the middle party-wise, but Senator Inhofe aggravates me to no end; I thought he was on the money when he complained about the dangers of military adventurism during the Clinton administration, but suddenly it was awesome during the Bush administration. I'm sure it's bad again, now. Anyway, never mind all that, point being, he has long been ridiculous and dare I say it unAmerican in his views on torture, and I thought I'd make something for calling him and those with him out. And didn't do much to get it passed around. Oh well. Here it is.